In the southwest corner of Bolivia sits Salar de Uyuni, also known as Salar de Tunupa – the world’s largest salt flat. At around 4,086 square miles, this gigantic flat was formed as a result of transformations between several prehistoric lakes. Covered by several meters of salt crust, the Salar de Uyuni is extraordinarily flat. In fact, across the entire area, the average elevation variation is under three feet. The crust itself serves as a source of salt covering the pool of brine, which is rich in lithium. 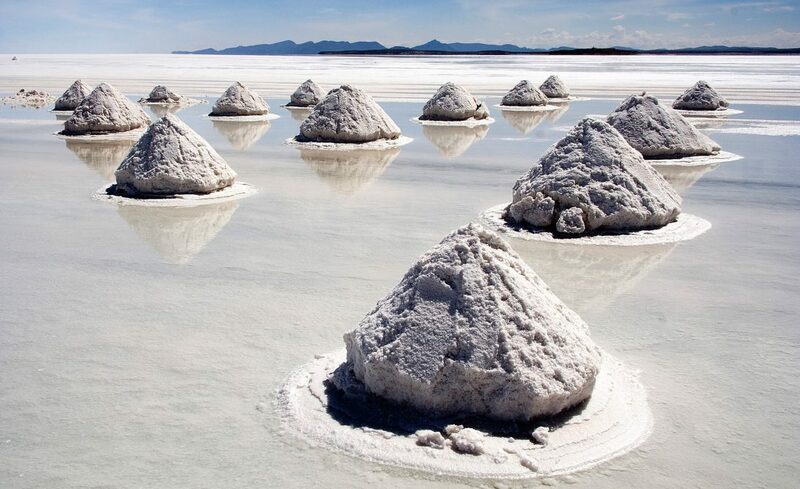 The Salar de Uyuni contains between 50% and 70% of the world’s known lithium reserves. In addition to having an interesting and significant mineral makeup, the Salar de Uyuni often sits below strikingly clear skies making for exceptional reflections and photographs. This is also the major transport route across the Bolivian Altiplano and serves as an essential breeding ground for several species of flamingo. In addition to housing flamingos, this strange part of the country is also home to Culpeo, a small fox, the Bolivian vizcacha, a small rodent, Vicunas, which look like llamas, and several species of bird, including the Andean goose and the Andean hillstar. Though a great travel destination for those interested in geology, fauna-lovers will find plenty to do here. The Salar de Uyuni attracts tourists from around the world. Though far from the country’s largest cities, a number of hotels have sprung up in the area to address the demand for accommodations. These hotels often provide an adventure in themselves; due to the lack of conventional construction materials, many are made almost entirely from salt blocks cut from the flat. While previous mismanagement caused serious environmental pollution, these hotels are not far more eco-friendly. While the Salar de Uyuni is an attraction in and of itself, there are several other unique places to visit in the area. The train cemetery, around a mile and a half outside of Uyuni, has several dozen abandoned trains that visitors can explore.